…and a sense of vocation”? Is he kidding? If Jeremy Hunt isn’t trying to rile the medical profession, he’s got a funny way of going about it. With tensions high and strike action on the cards, saying that contract reforms, the very source of the strain, will bring back “professionalism and a sense of vocation” to a career that attracts some of the most talented and dedicated people around is either a whole new level of crass or it’s designed to inflame. And inflame it has: on Saturday the BMA’s Junior Doctor Committee voted to ballot its members over strike action (or some other form of protest), which could happen within a few weeks. 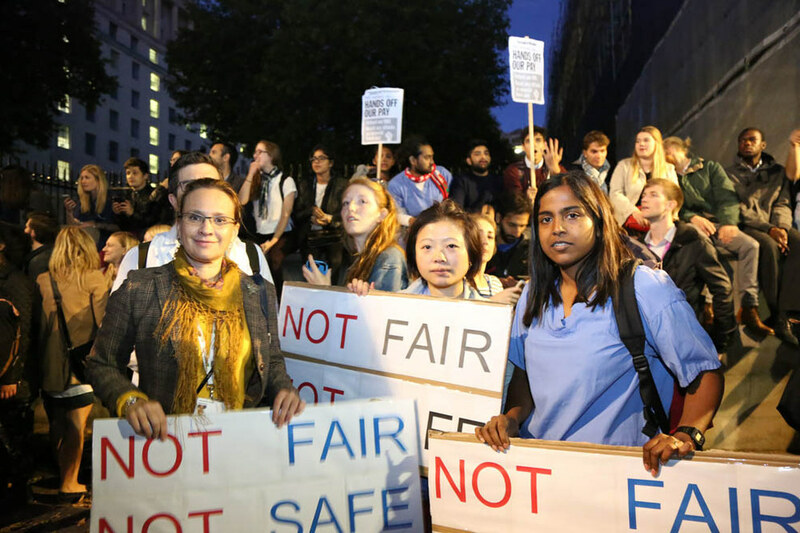 There could, and hopefully will be some agreement before then, but if NHS Employers are going to keep cancelling meetings with the BMA as they did Monday evening – possibly to avoid protests that were set to take place outside – it’s not looking too good. Ostensibly the reforms are about working towards a ‘7-day NHS’ service – nothing wrong with that. But let’s call this what it is: a way to pay doctors less and reduce the overall bill, plain and simple. Speaking in July at the Department of Health-sponsored procurement conference, P4H, which bills itself as the “largest event bringing buyers and sellers of the NHS together”, John Warrington, deputy director for policy and research in the procurement, investment and commercial division at the DH, said: “All the work that Lord Carter has done so far has been really focussed on the private sector, not workforces within hospitals – there are significant opportunities in those areas too. I am under pressure day in day out from the department and ministers to work efficiencies across the system”. When is a pay rise not a pay rise? Right now bureaucrats are ferreting away “day in day out” to come up with new ways to answer that question. Doctors’ salaries are complex: around 50 per cent comes from basic pay, the rest is from banding which compensates doctors in a number of ways based on their own particular workload. Of course, the government has left the basic pay alone – in fact it will go up – but it’s the extras, the un-headline-worthy bits that are being chopped. In the same way that the Living Wage increase has been handled, if you take away more with one hand than you give with the other, it’s not a rise at all simply an accounting trick. Firstly, when you hear ‘junior’, forget visions of hapless Doctor in the House students frantically flicking their way through medical crib sheets. It’s a misleading term that covers everything up to consultant level – which can take 10 years or longer after graduating – so in reality juniors can be in their mid or late 30s with families to support and mortgages to pay. And just so there’s no doubt: junior doctors do work seven-day weeks. Which is why Andrew Collier, who sits on the Junior Doctors Committee of the BMA, thinks there’s more to the story than meets the eye – and why 50,000 of his colleagues signed a petition in less than 48 hours last week. “Junior doctors are already working seven days a week,” he tells me. “So it seems crazy and perverse this can just be part of a seven-day agenda. Doctors can smell that there’s something not quite right about this and they are not happy. Doctors aren’t usually so switched on to medical politics, they just want to get on with their jobs, but meetings are filling up; this is unprecedented in my professional lifetime”. Why this unprecedented anger? NHS Employers maintains that this is a pay rise for junior doctors and that contract reforms will simplify the system. But the proposals on the table, many argue, in reality will heap more hours on junior doctors for less pay; remove protections against overwork and burnout; damage recruitment. A few details from the proposals: evening and weekend work will be classed as ‘normal’ hours. Doctors won’t be rewarded for extra hours they choose to take on to gain more experience. Time taken for research posts won’t be rewarded. Women going on maternity leave or any doctor working part-time won’t be subject to incremental pay increase. Breaks will reduced from 30 minutes every four hours to 20 minutes every six hours – the bare minimum under European guidelines, but as one doctor tells me, “when you’re talking about people at the cutting critical edge of things you don’t want someone who is ‘just safe’ for work”. As laughable as it is to describe doctors’ hours as standard, there is a definition of standard or ‘plain’ hours in existence, currently from 7am to 7pm. This will be changed to 10pm under the new contract extending ‘normal’ hours from 60 per week to 90. Again, this won’t change how many hours doctors work, it will simply reduce how the amount they’re paid for those hours. The Department of Health can’t say it hasn’t been warned – back in July thousands of doctors junior and senior took to social media to protest the proposed contract reforms, and since then a stream of typically well-informed doctors have written against the proposals in medical journals. And in a letter to Jeremy Hunt, leaked to the Guardian, the heads of no less than 11 Royal Colleges of medicine warned that the proposals “represent a real and immediate threat to the current stated priorities of the NHS, namely recruitment and retention of frontline staff and the provision of services across seven days”. There’s a tendency among the public, I think, to lack sympathy, even feel a certain resentment towards doctors when it comes to pay, given the handsome salaries you read about. It seems a little unjust given that a graduate from medical school will now be carrying a minimum of £45,000 of debt if they haven’t borrowed a penny more than tuition, that the average starting salary for a junior doctor is £23,000, and that real terms take-home pay has been steadily falling for years. But this isn’t just a financial argument. Doctors aren’t superhuman, though they are often expected to be, and anyone can make mistakes, especially when they’ve worked three 13-hour night-shifts in five days and when they’re also coming in on their days off to check up on patients. Technically a cap will be put in place so that no doctor can work over 72-hours in seven consecutive days. But if as feared the new contracts remove the financial penalties on trusts where staff are consistently working over their hours – some estimates put it at £1.5bn per year’s worth of overtime – what realistic protection will there be given how hard things are for trusts themselves? As Poppy Roberts, a trainee GP at the West Midlands Deanery, part of University Hospitals of Coventry and Warwickshire Trust, tells me, “This takes away the financial incentives to not overwork their junior doctors, which is not safe for patients. There’s a fear we could go back to the old days of working 100 hour weeks”. And then there’s the “already brittle recruitment situation”, as one doctor describes it to me. Roberts says: “30 per cent of GP training posts are unfilled at the moment, and we’re facing up to a 31 per cent pay cut. The government says it’s going to recruit 5,000 more GPs but that’s just nonsense”. With an alarming number of junior doctors already heading to health systems which hold their staff in higher regard, the effects of the new contract, plus the minimum £45,000 debts graduates bring with them to it, are potentially disastrous. Today it’s junior doctors, tomorrow it will be Healthcare Assistants (HCAs), Allied Health Professionals (AHPs) and anyone who’s ever pushed a trolley in a hospital. As usual there are plenty of unanswered questions: has NHS Employers actually worked out the potential impacts on patient safety of the new contracts? Is there any way it can guarantee junior doctors won’t be doing more than 72-hour weeks? How does it hope to tackle the recruitment problems across the system? Last night’s protest action was just a future echo of what could happen if Hunt and the BMA can’t solve their differences. The public has grown – or been raised – to be so disdainful of industrial action that if BMA membership does vote in favour and the strike goes ahead, I fear the finer details of this row won’t make it into the right-wing press. Instead we can expect furious condemnations from the Katie Hopkins and Sarah Vines of this world: insulting insinuations that doctors would ever put lives at risk and the sort of manipulation which wilfully overlooks the reasons why doctors are so stressed. In the face of this inevitable reactionary onslaught, we must all stand by our doctors, more than ever. We ignore the pleas of junior doctors at our own risk – the future of the NHS as a public service depends on them and their good will.